Excellent seaview. Sleeps 4. 1 Bedroom. 1 Bathroom. Wifi. Parking. Elegant suite in a breathtaking cliff-top position overlooking the east coast of Sicily on the second floor of the seafront mediterranean-style house at Santa Caterina (fraction of Acireale) within a nature reserve Timpa, a wonderful place to enjoy the nature and relax! The apartment consists of living room with open-plan kitchen, bedroom, bathroom (toilet, bidet, bath, shower), terrace with barbeque and solarium. 4 sleeping places are available (1 double bed and 1 double sofa bed). The decor is complete with everything needed. 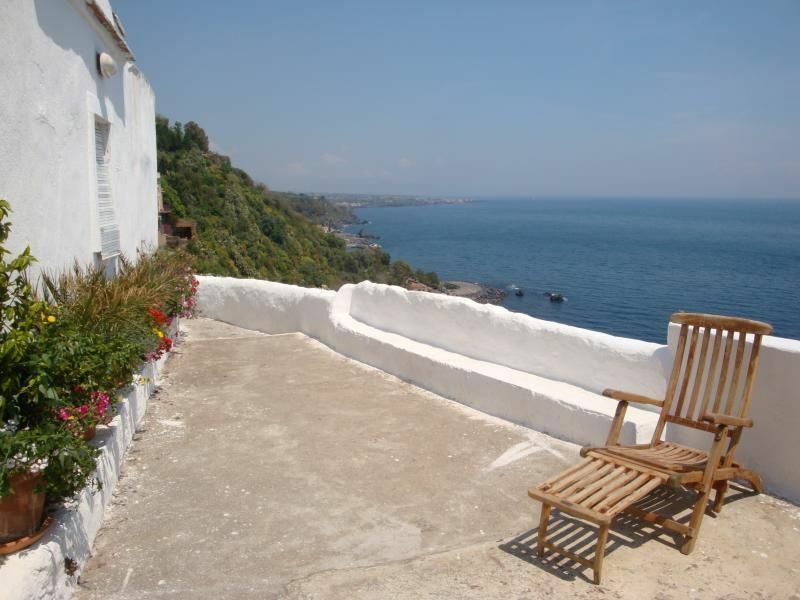 The apartment provides stunning panoramic views over the sea and the coastline from Acireale to Taomina. Only few houses on the coast can boast of such location and magnificent views of the sea, coastline and surroundings. Height above the sea level is 100m. Distance from the sea with a rocky coast is 300m. The town of Acireale is 400m away from the house reachable by foot in 10 minutes overcoming a small hill (auto is recommended). Parking place is available nearby the house. Hello! We are Elena & Giuseppe. We'll be happy to accomodate you in our house. All our properties you can find on our site For any information do not hesitate to contact us! Unique breathtaking cliff-top position with amazing panoramic views and strategic location for tourists: located in 5 minutes from the sea, less than half an hour from Mount Etna and in a few kilometers from the great tourist centers of Taormina, Giardini Naxos, Siracusa, Noto, Ragusa, Modica and Piazza Armerina. Parking free of charge nearby the house. Open-plan kitchen intergrated with living-room. Indoor and outdoor dining areas for 4 persons. Zuerst das Positive: die Lage und die Aussicht sind tatsächlich einzigartig. Die Vermieter waren sehr freundlich. Ansonsten fanden wir das Apartment keinesfalls luxuriös. Dabei hat uns weniger die einfache Ausstattung der Küchenzeile gestört, sondern des Gesamtzustand. Von vier Türen haben drei geklemmt. Wenn man sie zu gemacht hat rieselte der Putz unter dem Türsturz hervor. Am Herd funktionierten nur zwei von vier Flammen, auch auf unsere Nachfrage hin wurde das Problem nicht behoben. Am unangenehmsten war aber, dass die Wohnung sehr feucht war. Das lag sicher nicht nur am Regenwetter, denn in der Wohnküche war ein großer Wasserschaden mit Schimmelbildung und es regnete herein. Eigentlich könnte das ein wunderschönes Apartment sein, aber so ist es eine echte Enttäuschung. We are sorry that the guest did not like the apartment, however we strongly belive that 1 star from 5 is absolutely undeserved undervaluation. The kitchen is ok, the doors do not have any problems at all. And the humidity is no more then in any other sicilian seafront house in winter time. If you goes thousand miles away from home, at least be ready that the climat is different. Acireale is a well-known spa resort, vivid example of Sicilian Baroque and the town of the most beautiful carnival in Sicily. Strategic location for tourists: located in 5 minutes from the sea, less than half an hour from Mount Etna and in a few kilometers from the great tourist centers of Taormina, Giardini Naxos, Siracusa, Noto, Ragusa, Modica and Piazza Armerina.